Surface Pro 3 owners, be careful around your power buttons. As part of a massive suite of Windows 10 news on Thursday, Microsoft rolled out a new beta version of its PC and tablet operating system, Build 10576, to members of the Windows Insider Program. 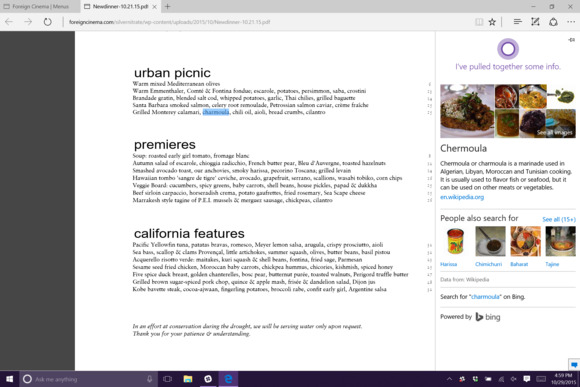 The big changes inside the new build are focused on improving Microsoft's Edge Browser. In particular, Edge now lets users send videos, images and audio over a network to any device equipped with Miracast and DLNA. Using that capability, they can share things like a Facebook photo album, a YouTube video or a Pandora audio stream. However, it's worth noting that the capability doesn't extend to casting protected content (like videos streamed from Netflix) so it's not a one-size-fits-all solution for getting stuff off a PC and onto something like a Miracast TV. In addition, people can now use Edge's "Ask Cortana" feature to get more information about selected text inside a PDF they opened in the browser. It's another expansion of Microsoft's personal assistant and could help with things like understanding obscure menu items when searching for where to go for dinner. There are some known bugs with this build, including a few real doozies. In particular, Surface Pro 3 users who press the hardware power button may find that they have just shut down their devices rather than putting them to sleep. Small-screened tablets like the Dell Venue 8 Pro that boot with their virtual screen size set larger than their actual screen size will crash and roll back to the previous build after being updated, much like what happened with the previous build that Microsoft launched earlier this month. Finally, users will find that their Skype messages and contacts have been erased from the Messages app. To fix that, they need to either re-install the app from the Windows Store or delete a particular file, which is identified in Microsoft's blog post announcing the new build. The news comes as the company also announced that it would start sending the Windows 10 update out automatically to some consumers next year, along with the release of a new Windows 10 Mobile build.